The algae in Blue Cypress Lake contains microcystin at a rate of 4,700 parts per billion. Levels above 10 parts per billion are considered hazardous to humans. Biosolids provide a cheap source of fertilizer at ranches, including Pressley Ranch near Blue Cypress Lake. 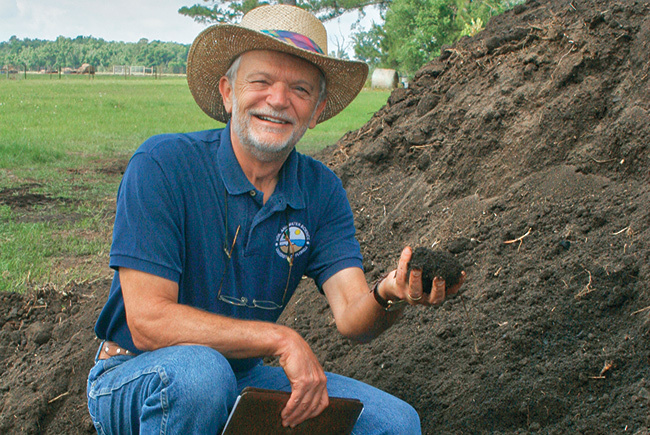 UF professor George O'Connor says biosolids get a bad rap because of "the yuck factor." Tests at Blue Cypress Lake have turned up sucralose and acetaminophen. "The only other possible source of pollution would be cattle, and cattle aren't using artificial sweeteners and taking aspirin," says ORCA founder Edie Widder. Biosolids: Waste to fertilizer to - pollution? One region's waste fertilizes another region's pastures — but becomes a source of pollution in the process. The St. Johns River, more than two miles wide by the time it empties into the Atlantic Ocean near Jacksonville, begins more than 300 miles to the south at a secluded spot in Indian River County called Blue Cypress Lake. Long, wide and shallow, Blue Cypress gets its name from the thousands of bald cypress trees that surround it and the deep, oceanlike color of its water when sunlight glints off it. The nearest town of any significance to Blue Cypress Lake is Fellsmere, about 10 miles to the east. There’s a tiny community called Blue Cypress Village on the western bank — about 75 homes, all connected to a county sewer line — plus a fish camp and a few cabins. The rest of the lake is surrounded by marshes and pastureland. However isolated the lake seems, toxic blue-green algae have begun blooming there. 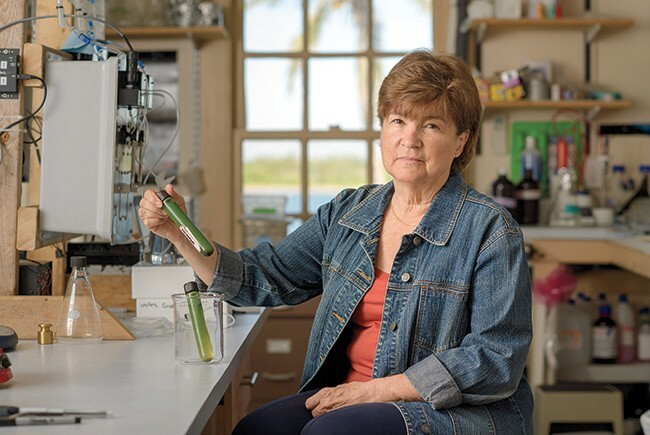 Tests conducted this year by the Ocean Research & Conservation Association of Fort Pierce found that the lake’s algae contained the toxin microcystin at a rate of 4,700 parts per billion, says Edie Widder, ORCA’s founder, CEO and senior scientist. For context: The World Health Organization says recreational waters with microcystin levels above 10 parts per billion are hazardous to human health. Widder and other locals are convinced they’ve identified the culprit. Five years ago, a ranch bordering the lake began using treated waste from municipal sewage plants as a cheap source of fertilizer. Known formally as biosolids and less formally as sludge, the material has been treated to control or kill pathogens and avoid attracting insects, rodents and birds. But it also contains lots of phosphorous, which, when washed into rivers and lakes, fuels the growth of algae. The complaints have the attention of local officials. In July, commissioners in Indian River County voted to ban the spread of biosolids anywhere in the county for six months while more studies are conducted. The town of Fellsmere did the same a month later. Meanwhile, DEP, which has stressed that there is not yet a definitive connection between the biosolids spread at Pressley Ranch and the algal blooms in Blue Cypress Lake, also imposed a six-month moratorium on the ranch itself. 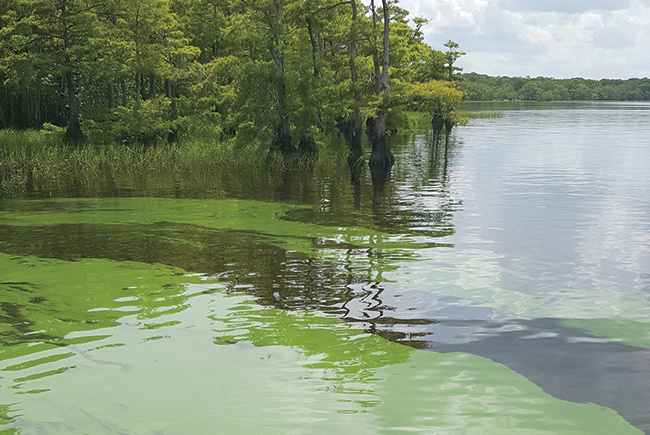 What’s happening at Blue Cypress Lake may be the tip of a much larger problem for Florida. As the state has grown, so has the amount of feces it produces. The Florida Department of Environmental Protection says wastewater treatment plants around the state now produce about 340,000 dry tons of biosolids a year. Roughly a third is being spread on ranches as fertilizer. (Another third is being processed into commercialgrade fertilizer, a much more expensive process, and the remaining third is being dumped in landfills). About a decade ago, biosolids were identified as a culprit in nutrient pollution in the Lake Okeechobee watershed. 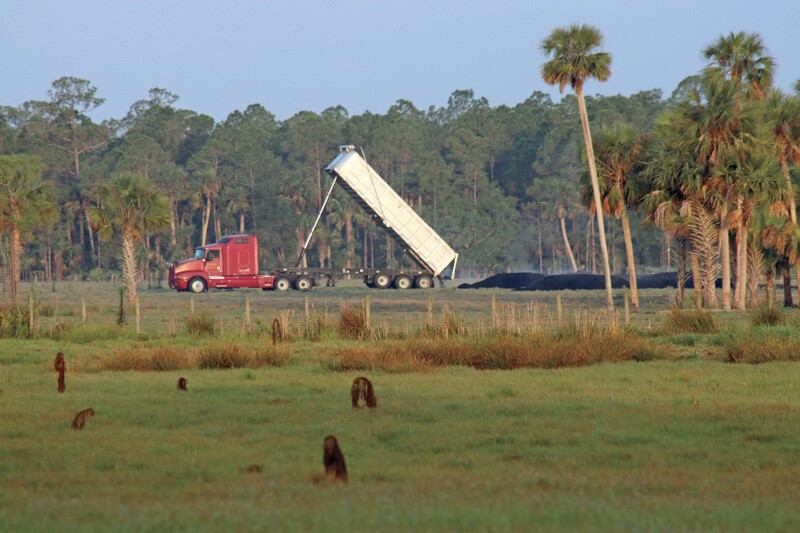 The Florida Legislature responded by banning the spread of class B biosolids — the mostly lightly treated form of waste and the bulk of what is spread on pasture land — in South Florida. The problem moved north. Since 2013, when rule changes were fully implemented and grandfathered permits had expired, the amount of biosolids being applied in the upper St. Johns River basin has nearly doubled, according to the St. Johns River Water Management District. Roughly a third of the district’s water-quality monitoring stations in the basin, which runs roughly from Indian River County to north of Titusville, now show longterm trends of phosphorous growth. Altogether, DEP approved the spread of more than 70,000 tons of class B biosolids in 2016 just in the upper basin of the river, which includes Indian River, Osceola and Brevard counties, according to St. Johns Riverkeeper. Those three counties accounted for three-quarters of the total amount of class B biosolids permitted statewide. Why is so much being spread in this one part of the state? The area has hundreds of thousands of acres of cattle pastures — the only type of farming for which the biosolids can be used as fertilizer. (They can’t be spread on farms growing food crops because of potential health hazards). And it’s the nearest available region to the population centers in South Florida, which have to send their sludge north of the Okechoobee watershed. Miami alone sent more than 93,000 tons of biosolids to the upper basin of the St. Johns between 2013 and 2016, according to DEP figures, making it by far the single source of the region’s biosolids.